Don’t let your pet’s food and water dishes become a science experiment. Help to keep your pets healthy by following this simple routine on a regular basis. We all know that we should ensure our pets have access to clean, fresh water at all times. As a rule of thumb, my vet advised me that our dog needs roughly two ounces of water per kilogram of body weight (which is about a one ounce to one pound ratio). Cats tend to get most of their moisture requirements from their food but should also have access to a clean water source. Food requirements will vary based on the size and nutritional requirements of your pet. Whether you are feeding them wet (canned) or dry food or a mixture of foods you prepare yourself it is important to ensure it is provided in a clean dish. The easiest way to ensure your pets food dish is clean is to ensure that you pick up the dish after your pet is done eating and give it a quick wash. This not only encourages healthy eating habits, it can also assist with controlling your pet’s weight. Provide your pet with their meal and allow them a reasonable period of time to eat. For most pet’s this will be no more than 10-20 minutes. Once your pet has finished their meal, or no longer shows interest in the food, pick up the dish and discard any remaining food. Next, wash the dish in warm water using dishwashing detergent. Ensure that you clean the inside and outside of the bowl and rinse thoroughly. Completely dry the dish and it will be ready for your next feed time. If you are unable to wash the dish immediately, it is a good idea to clean it prior to your next feed. Note: If you feed your pets fresh bones, it is recommended that you remove the bone within 24 hours. This will not only help keep bacteria and parasites at bay but also bones harden and can be a chewing hazard for your pet. Water dishes should be washed daily using warm water and dishwashing detergent. If you are using a water fountain or automatic water station that has a dish and jug setup ensure you wash all components on a regular basis. Bacteria and fungus can live in and around the dish and usually a simple clean is all that is needed to keep your water source clear and fresh for your pet. What type of dish is best for my pet? 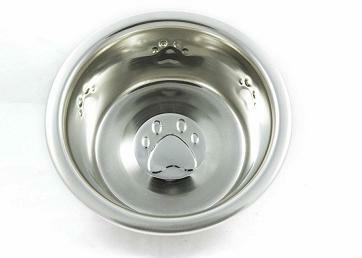 Stainless steel dishes tolerate enthusiastic pets and frequent washing very well. They last for years and still look great. A simple and natural scrub for stainless steel dishes can be made from combining baking soda, salt and water to form a paste. Rub vigorously to remove any food, gunk and even light scratches from your dish. Rinse thoroughly. Ceramic dishes come in more fashionable options but are subject to breaking and scratching. Plastic dishes can quickly become chewing toys for pets. Plastic can also deteriorate over time and become brittle. Mine get cleaned as my own dishes, in dishwasher and replaced .